Of course, I lived with a girl once before. It didn’t end badly, but it did end. I kept a blog about what happened after it ended, A Year in Pictures Following the Breakup. It seems very long ago now. 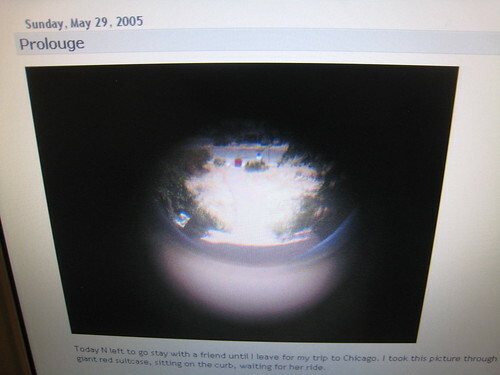 And when I say “I kept a blog about what happened after,” I mostly mean what happened after to me. In the interest of making a clean break, we didn’t communicate much with each other after I moved back to Chicago. I did email her (let’s call her N) a yearly update, just a quick hello to let her know what I was up to. She rarely responded. About two years ago she wrote to tell me she was happy and married and had a daughter. I wrote back that I was happy and happy for her, which was the truth. After that I stopped sending updates. Maybe I finally felt like it was safe for me to stop worrying about her. I even sat down and started writing something. “Dear N. It’s been a while.” But I didn’t get very far. It just sounded awkward. That time is past. Mostly, though, I think I worried that I was secretly fishing for blog material. An interesting quote. Didn’t I really want to just write, “Hey, what was I like to live with?” And it seemed wise not to open that can of worms.